Do you think you are safe from lightning when in a stadium? If you are a college football fan, you probably noticed that the game between the University of Oklahoma and Ohio State University was delayed on Saturday, Sept 17. Media may have shown rain falling, but it was actually a lightning delay that caused the issues. 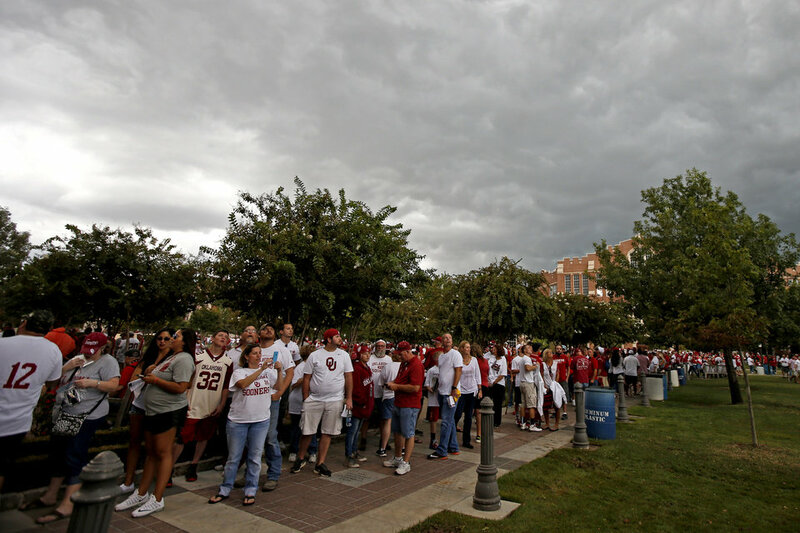 As fans lined up for entry to the game, storm clouds began to approach. Officials opened up the stadium early to allow people to take shelter. While under a severe storm warning, the rain came down and winds pushed through the area. Most took cover under the seating, but many students remained in their seats as lightning struck all around them. WeatherOps forecasters were on-site assisting OU Emergency Preparedness with decision support. Yet, all the safety lessons and appropriate messaging apparently couldn't make some people move from their seats. 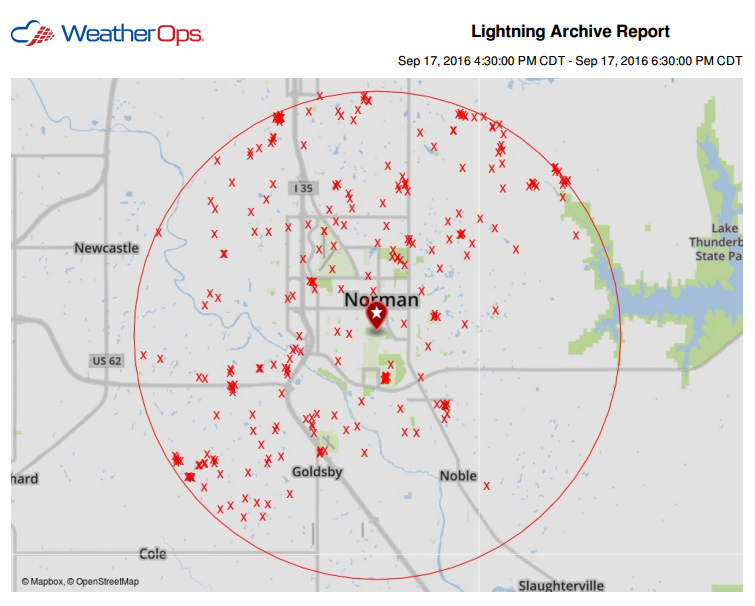 Between 4:30 PM and 6:30 PM, there were 287 cloud-to-ground strikes within eight miles of the OU stadium. The game, scheduled to start at 6:30 PM, was delayed due to this. This is not an issue unique to the University of Oklahoma. 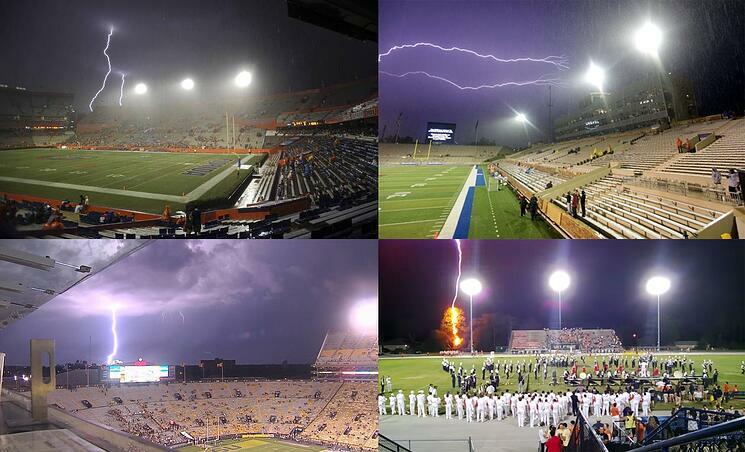 Check the following images of other stadiums where people chose to stay seated or outside during lightning. 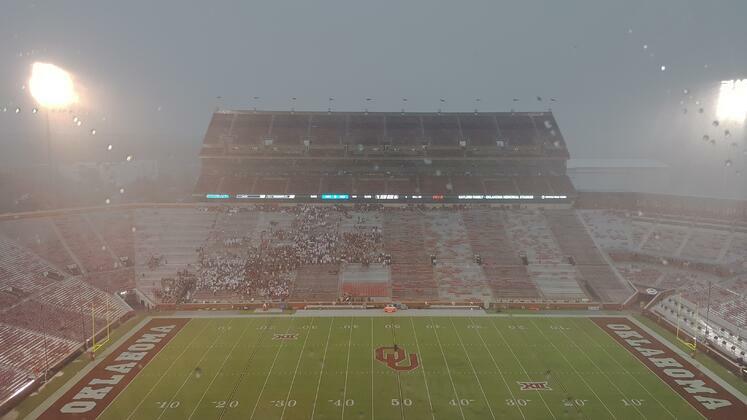 The fact is, stadiums are not at all safe to be in during a thunderstorm. With high seating decks, tall light posts, and large empty parking areas around them, it is not uncommon at all for lightning to chose to discharge through them. Tailgate tents may shelter you from rain, but they do not prevent you from being struck by lightning. And this is not an issue just concerning football; outdoor soccer, baseball, golf and tennis are also sports where fans need to be more aware of the weather. The football season has just started. Now is the time to make a plan and know where the safe spots are for the sake of your safety. Evacuating a large complex can take time, so it's best to take action as quickly as possible. If the stadium monitors and personnel tell you to evacuate, move to shelter. If you see lightning or hear thunder, move to shelter. In a stadium, you should go into an enclosed area. If outside tailgating, you should shelter in a vehicle. Next time you go to a game, pay attention to the weather. If you are in charge of the event, WeatherOps can help. If you are in charge of your personal safety, RadarScope and Weather Radio can help you make appropriate decisions at a great price-point. While I enjoy watching football, it is not more important than my life. Taking the proper precautions will assist in making sure you can see more football games to come.